Hanoi is the capital of Vietnam. It is known that Vietnam features three slenderness. They are slender women, slender houses, and slender shape of the country. It occupies the whole east coast of the Indochina Peninsula along the South China Sea. Ba Dinh Square in front of the Ho Chi Ming Mausoleum–Ho Chi Ming is the father of Vietnam. He united Vietnam, fought against French colonialism and liberated Vietnam from foreigners as well as fought the Japanese during World War II. Temple of Literature-built in 1070, a temple dedicated to Confucius, also hosts the Imperial Academy, Vietnam’s first university. In the park across from the Temple of Literature was where calligraphists assemble before the Vietnamese New Year to write wishes in Hán characters. The artworks are given away as gifts or are used as home decorations for special occasions. The entrance to Welcoming Morning Sunlight Bridge. Tran Quoc Pagoda situated on the West Lake was once by the Red River built-in 15 hundred. The tallest pagoda was rebuilt in 2004 holding monk’s ashes. The Tran Quoc old temple where people go the pray is the oldest Buddhist temple in Hanoi. The altar is to the Buddha, Sangha, and Buddha Dharma. There is a Bodhi tree that is propagated from the original Bodhi tree under which Buddha obtained enlightenment. St. Joseph’s Cathedral is a church on Nha Tho Street in the Hoàn Kiếm District of Hanoi, Vietnam. It’s a late 19th-century Gothic Revival church of the Roman Catholic Archdiocese is still being used for the Catholics of Hanoi. Hoan Kiem District -“Old Quarter” An old busy market place where one can find various vendors, and bicycles, streetcars, scooters zigzagging around. Crisscrossing between old colonial buildings and old town gate and some leftover standing walls. One Pillar Temple built by Emperor Lý Thái Tông in 1040 in gratitude for granting him a son after being without an heir for twenty some years on the throne. It was designed to symbolize a Lotus flower rising from a muddy pond. Just as in the emperor’s dream how his son was brought to him in a lotus flower by Avalokitesvara Bodhisattva. People come to pray for babies here. The original pillar was of wood but was blown up by the French as they were retreating. What one sees is a concrete replacement. Follow the construction of One Pillar Temple, in gratitude of continue descendant, this temple was built next door. Like the first one, it was dedicated to Kwan Yin or Avalokitesvara Bodhisattva. Vietnamese art in everyday use is very practical in bringing happiness to all. A little mankind’s creativity on the goodness of Mother Nature. Ha Long Bay is about a three and a half hour bus ride from Hanoi. This is a UNESCO Heritage Sit due to the extraordinary bay-scape. The Bay covers a 1533 square kilometers but consist of around 2,000 islets of various size and shape. The limestone of the bay shows 500 millions years of evolution. There are many species of plants and animals on the karst that had gone through 20 million years of evolution in the tropical climate typical for this environment. La Han Bay, where we board the cruise ship. Tiptop island named after the Soviet Astronaut Ghermann Titov. The island has a crescent beach with white sand. One can swim and eat here 24 hours. Many tourist ships anchors nearby. On top of the island, one can see the whole Halong Bay. Colosseum, the iconic symbol of Imperial Rome, is on the New Seven Wonders of the World List and one of the popular tourist attractions of Italy. Built-in 70 AD and finished in 80 AD during the Flavian dynasty hence also known as the Flavian Amphitheater. This is the Largest amphitheater in the world, It is of oval shape with measurement of 189 meters long and 156 meters wide. The base area is 24,000 sq. feet, the perimeter is 545 meters and the height is 48 meters. It can hold 50,000 to 80,000 spectators. During the Roman times, the Colosseum provides fights of gladiators and wild animals or executions by wild animals for entertainment. The spectators my yell out whether they like to see the kill or show mercy to the fighters, but the emperor had the right to override the decision. Usually, the gladiator fights were scheduled in the mornings and the animal fights were scheduled in the afternoons with the executions in between. The blood of the dead gladiators and the animals were bottled for the witch doctors to give as health tonics for the sick. Inside the Colosseum, we can see the lower level where the animals and gladiators were kept while they waited for their turn to go on. The platform was where the base of the arena was and around on the top were tiers of seating for the spectators. After the 7th century, the arena was converted to a cemetery, and the lower level was converted for housing and workshops. During the 12th century, it was a castle for a while, until 1349 it was destroyed by the great earthquake. Stones and other valuable building materials were carried away for other projects. Several crosses were erected for the many martyrdom that happened here. Arch of Constantine built to commemorate the Victory of Constantine I in the Battle of Milvian Bridge. This three-arches triumphal arch is 21 meters high and 25 meters wide, built-in the year 315. What’s left of the Temple of Roma and Venus once known as a grand building in Ancient Rome. Construction began in 121 and finished in 141. What follows is what happen to any grand buildings, that its valuables were gradually stripped for other building projects and the final major destruction was of an earthquake. Arch of Titus was constructed by Emperor Domitian around 82 AD to commemorate his brother, Titus’s victories. Use to be the Temple of Saturn . Built round 497 BC, was the first temple built on the Forum dedicated to the supreme god of Etruscan origin. Arch of Septimius Severus , 23 meters arch of 203 AD was the symbolic center of ancient Rome. The Curia, the meeting place of the Roman Senators. The best preserved building on the site. What’s left of Temple of Castor and Pollux, built to give thanks in victory of battles. Castor and Pollux were of myths of Greek/Etruscan origin. Santa Francesca Romana used to be named Santa Maria Nova as the plaque says when it was built in the late 10th century. An 8th-century oratory excavated from the wing of the Temple of Venus and Roma was incorporated. Later when the bell tower was added in the 13th century, Pope Honorius III built the apse decorated with a mosaic of enthroned Madonna with Saints. In the 16th century, it was rededicated to Frances of Rome, canonized in 1608, whose relics were in the crypt. Saint Francesca Romana is the patron Saint of car drivers. On March 9, cars would line up to partake in the blessing at the feast. A delicious lunch at Pasqualino al Colosseo. Ballet: La Belle au good Dormanti at the theater. A traditional Italian restaurant who makes everything fresh. Yes, including all kinds of pasta. Quartiere Coppede is the smallest district of Rome. The outstanding whimsical style is by Gino Coppede. This district may be small but it is very exclusive. It is finished in 1924 consist of 26 small apartments and 7 Villas. The Beatles danced in the Fountain of Frogs (Fontana delle Rane) and it appeared in some scenes of the film ” The Bird with the Crystal Plumage” an Italian film released in 1970. The average price of this smallest district is approximately 10,000 Euros per sq. meters. Eur district’s Palazzo della Civiltà del Lavoro, or “square colosseum”. a white building with the same amount of arches as Mussolini’s first name and surname. It houses several museums. Other beautiful buildings in Rome. Rome, the capital city of Italy. It is the oldest continuous inhabited site in Europe even though history can only be traced back to the beginning of Rome around 753 BC. It is the birthplace of western civilization and claims the be the “eternal city”. This historic center is on the UNESCO list as the World Heritage Site. Under the city of Rome has many layers of cities from pre-historic Roman times. The city itself is a big archeology site. The Castel Sant’Angelo (Castle of Holy Angel) in Parco Adriano was first built by Roman Emperor Hadrian as a mausoleum for himself and his family. Since it was the tallest building at that time, the Popes took over and made it a fortress/residence. Ashes of the emperors were scattered and the valuable materials and decorations were removed and brought over for the use of building St. Peter’s Basilica. The building was also used as a prison. Executions were done at the inner courtyard. On top is the statue of Archangel Michael for ending the plague of 590. Today it is a museum. Ponte Saint’Angelo bridge, a Roman bridge built in 134 AD. This pedestrian bridge crosses over the Tiber River and leads into the Castel Sant’Angelo on the right bank of Tiber River. In 1669, Pope Clement IX commissioned Gian Lorenzo Bernini for the sculptures of Angels symbolizing the stories of the crucifixion sufferings of Jesus Christ. The angels on the bridge were designed by Bernini but finished by his successor. He was able to finish two which is the angel with the Crown of Thorns and angel with the Superscription. These are the Angel with the Cross and Angel with the Superscription. This is a copy of the original by Bernini and his son Paolo. The original along with the Angel with the Crown of Thorns is in the church of Sant’Andrea delle Fratte. Via della Conciliazione heading away from St. Peter’s Basilica towards Ponte Sant’Angelo. This road is a major throughway ordered by Benita Mussolini to connect the Vatican to the heart of Rome. Ponte Vittorio Emanuele II bridge designed in 1886 by Ennio De Rossi. The bridge crosses the Tiber, the river known as the birthplace of Rome, to connect the historic city of Rome to the Vatican City. Fontana del Moro is a fountain located at the southern end of the Piazza Navona in Rome. The dolphin and the four Tritons were by Giacomo della Porta in 1575. The Moor or the Ethiopian out of the conch were added by Gian Lorenzo Bernini in 1653. 1874 during the restoration of the fountain, the original sculptures were removed to the Galleria Borghese. The building behind is Palazzo Pamphilj built in 1644 and 1650. In 1920 it was purchased by Brazil and became the Brazilian embassy in Italy. Sant’Agnese in Piazza Navona is a 17th-century Baroque church. This is where the early Christian Saint Agnese was martyred in the Roman Stadium Domitian upon which the Piazza Navona was built on. The Spanish steps, a set of steps built in the 17th century to connect from the lower Piazza di Spagna to the Piazza Trinità dei Monti, on the top where we see the Trinità dei Monti church. Because the 135 steps were irregular consists of straight and curve flights as well as terraces were unique and elegant inspired many artists, painters, and poets. Many beautiful women gathered here in hopes to model for artists. They, in turn, attracted many rich Romans and travelers here. Eventually, it became a preferred meeting place. Capitoline Museums, at Capitoline Hill. Designed by Michelangelo is the first museum in the world opened in 1734. The mounted rider in the front is Emperor Marcus Aurelius. Vittorio Emanuele II Monument or Altare della Patria. monument in honor of Vittorio Emauele II, the first king of a unified Italy. The statues on the rooftop are goddess Victoria on a chariot pulled by 4 horses. The Pantheon, a 2,000-year-old architectural wonder of the Romans. Was built to honor all Gods but later turned into a church dedicated to St. Mary and the Martyrs. The 16 Corinthian columns supporting the portico weights 60 tons each and was from a quarry in Egypt. It was floated on wooden barges down the River Nile in spring when the water level was high and then shipped across the Mediterranean to Roman port of Ostia then pulled up the Tiber River on wooden barges to Rome. The dome of the Pantheon is the largest unsupported dome in the world for 1300 years. Its top has an opening, the “Oculus” which is the only opening to bring in natural light into the Pantheon. At mid-day on April 21st, the light will shine in and strike the metal grille above the door reflected light up the front courtyard. The tombs of many Italian kings and poets including the famous artist, Raphael is placed here. Siem Reap is a resort city of Cambodia, a gateway to Angkor, an important and largest UNESCO archeological site. Angkor used to be the capital of the Khmer Kingdom during the 9th to 14th century. The 400 sq. kilometers of Angkor area consists of monuments, temples, residence, with features of different ancient urban plans, such as water reservoirs, hydraulic structures as basins, dykes, canals, and communication routes, as well as its architectural and artistic significance, that can attest to an ancient civilization for several centuries unique to Southeast Asia. Angkor Thom was the last capital of Khmer Kingdom built by King Jayavarman VII in the 12th century. One may also take an elephant ride to Angkor Thom. Aligned on both side of the causeway is a seven-headed Naga which is a celestial being with a snakelike body and human head. Riding on it are Devas along the left side of the causeway and Asuras along the right side of the causeway. Bayon, the state temple of Angkor Thom, situated in the center of Angkor Thom. It was first built by King Jayavarman VII the first Mahayana Buddhism King, in the 12th century and late 13th century. Bayon was first built as a Mahayana Buddhism Temple but later it was modified to accommodate Hinduism and Theravada Buddhism. Most notable are the serene faces on top of all the pointed towers. The temple does not seem to have its own walls or moats to define its area. It is only surrounded by enclosures of three layer of galleries. Center tower rises 43 meters above ground. All towers have these faces carved on top, up to approximately 400. It has been said that these faces are of Bodhisattva Avalokitesvara or Lokesvara or even King Jayavarman VII himself. People also noted that the most sincere smile is the picture of the lower right. Carvings on the columns and walls of the galleries are dancers and stories of life during the Khmer Kingdom. Within Angkor Thom is a Terrace of Elephants. The structures on it had all been degraded by nature except the platform which was used for the King to greet the returning victorious army. Another terrace used to have statues of animals and the 12 animals of the Chinese zodiac animals. Unfortunately, they have been looted. Ta Prohm was a monastery in Angkor Thom. It is the only place that was better preserved. In 1992 it was included in the UNESCO world heritage list. Ta Prohm is much left to how it was found. The only work is to prop it up at certain places. It is also the best-preserved structure of this area due to the nature of the forest trees that had grown around it. There are 2 types of trees that cause the coverage. The large ones are of silk-cotton tree (Ceiba pentandra) or thitpok Tetrameles nudiflora and the smaller ones are of strangler fig (Ficus gibbosa). or gold apple (Diospyros decandra). Docks for boats going up the Rhine River. Amsterdam was a small fishing village in the 12th century that turned into a major port city in the 17th century during the Dutch Golden Age. Amsterdam has many water canals, not just for easy transport but also because Amsterdam is mostly under sea level. The canals are the result of the dams and dikes that was built to hold off the flood water from the sea. The well-known windmills were energy source used to pump water back into the sea to keep the land dry. Having to constantly balance the level of waters, the Dutch has created the modern water management system of today which is continuously updating as the rising sea level of global warming. Rijksmuseum is the national museum dedicated to the arts and history of Amsterdam. Other scenes within the museum. Some interesting paintings on display at the museum. We can see the progression of paintings from still portraits on the simple life and still objects to intricate brushwork, using white to bring out the lace and fabric; and later paintings showing actions and motions. History Scene with a Self Portrait by Rembrandt van Rijn (1606-1669) earlier work of Rembrandt and his head is to the right of the painting behind scepter. Fishing for Souls by Adriaen Pietersz van de Venne (1589-1662) Catholics on the right and Protestants on the left of the painting. The Night Watch by Rembrandt van Rijn in 1642 famous for its lighting and as in motion. Cologne is the 4th largest city in Germany and the most populated city of the Rhine River. Cologne had been a major trading route between east and west Europe. The city was built by the Romans, occupied by the Holy Roman Empire, by the French during Napoleonic Era, and by the British briefly, after World War I. During World War II, about 61% of the city was destroyed. The cities pre-war Jewish population were either deported or killed. The city’s six synagogues were destroyed. Today’s Cologne was the result of the 1945 Cologne urban planning and 1947 reconstruction of the city. The constructions of streets and thoroughfares to the city center help to modernize the city. Some old landmarks were chosen to be rebuilt. Cologne is a modern city with reflections of the old. 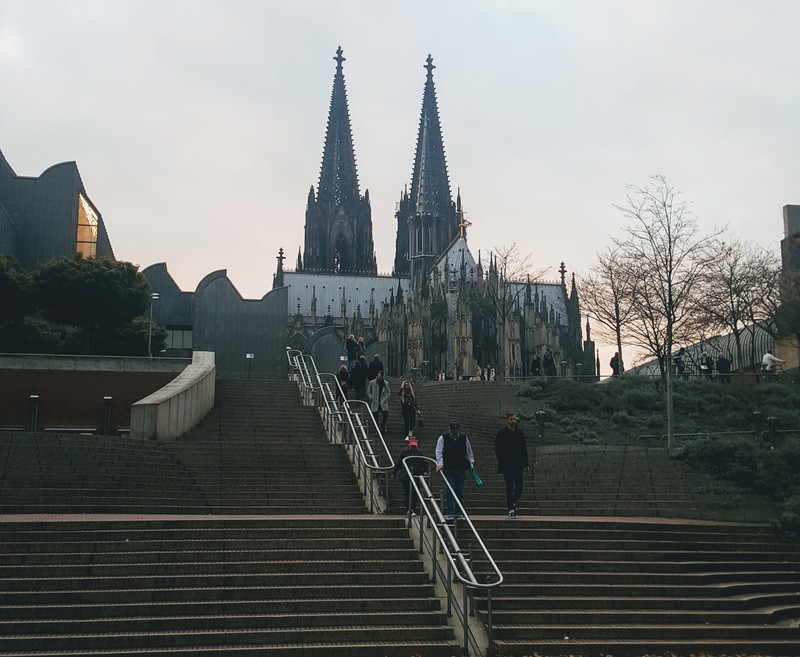 The Kolner Dom (The Cathedral Church of St Peter) is the tallest building second to the Telecommunication tower of 1981. It is the landmark of Cologne which can be seen all around town. It can hold more than 20,000 people. Because it holds the shrine of the Three Wise Men and has impressive stain-glass windows, it was included in the UNESCO world heritage site. Cologne Cathedral (Kolner Dom) most loved Gothic church build between 1248 and 1880. Inside the cathedral and the stain-glass windows. Great St. Martin Church a Romanesque Catholic church built on the foundation of a Roman chapel. Was rebuilt in 1985. The Famous Farina House Cologne Shop founded in 1709. Made the first Cologne Fragrance known worldwide. Lastly a refreshing beer. Salute!